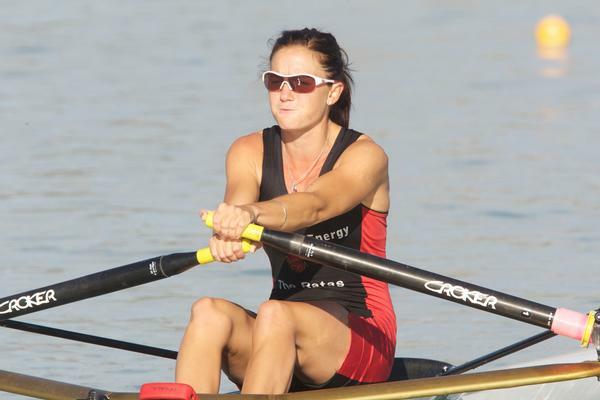 Rowing's lightweight women stole the limelight today at the 2011 BankLink New Zealand Rowing Championships with all of the top athletes making it through to what should be an exceptional final on Friday morning. In a pair of semi finals that demonstrated just how strong this class of rowing is in New Zealand, world silver medallist Louise Ayling, lightweight single scull national title holder Lucy Strack, Waikato's Julia Edward and Alyce Pulford, as well as up and coming Leah Stanley and Lana Davison all made it through to the final. The lightweight double scull for women is an Olympic event, and after a very promising performance by Strack and Edward at Karapiro 2010, along with Ayling's silver in the non-Olympic single, the race for a seat in the boat for 2012 is really beginning to gather some pace. The entire field in the final is covered by just eight seconds on the ergometer test, all of the girls are young and all are about the same weight and size. All have international experience too. "It's really close and that's great for the athletes," said Ayling. "In fact it's so close that genuinely anyone of us could win it with the right row." That's also great news for the sport. With the men's lightweight double scull and single scull already successful, this new young group of women are bursting with potential. Long term, that can only be good for Olympic prospects, but with the girls representing clubs and not racing with usual partners in the light double sculls event, the emphasis has fallen on the single and it has produced one of the best fields in the regatta. "Everyone in that field is dangerous," added Strack, who took out the first semi final before watching her Karapiro crew mate Julia Edward win the second. "It's such a strong group. All of the girls have raced well at some stage during the summer and all have showed they have the pace and ability to win it. When it comes down to it, we will all need to look for that special row that will push us out in front." The final takes place on Friday at 9.30am and should be a fantastic curtain raiser for a Pete Taylor and Duncan Grant battle in the men's event. Elsewhere at the regatta Hyde and Wilson of Rotorua won a tight race in the women's club double scull against Hawkes Bay to secure one of the favoured lanes in the final. They will be joined by Petone 1, North Shore 2, Avon 1 and Timaru 1. Hayden Cohen, brother of world champion nathan and an up and coming member of the country's junior national teams, showed his potential with a good win in the semi finals of the Under 21 single scull. He will start the final as fastest qualifier ahead of what should be a tightly packed field. The New Zealand national squad - as well as those athletes with hopes of making the team in future seasons - will be well represented in the finals taking place on Friday. First off will be the top pairs event for women and men with the men's race a showdown that should be fought out between the Waikato RPC pairing of Eric Murray and David Eade and Southern RPC's Hamish Bond and Jade Uru - the reigning national champions. Rebecca Scown is world champion in the pairs and in the absence of Juliette Haigh, should be odds on for a win with fellow squad member Louise Trappitt. The Premier doubles races also take place in the afternoon, and another superb clash between world champions is in the offing. Nathan Cohen is back with Matthew Trott for this regatta and should start as favourites slightly ahead of world champ Joe Sullivan and his crew mate Robbie Manson. Mahe Drysdale and Peter Taylor scull for Auckland RPC, and could be a fly in the ointment if they can show the speed they demonstrated at last year's regatta. The men's straight fours will be a three way clash between Waikato, Southern and Central RPC, with Central's men looking to get their finals campaign off to a good start. If everything goes to plan, current form suggests they could win the straight four, the coxed four and the eight - but all three squads are packed with talent and it is difficult to make any of the three an outright favourite. The weather looks good for a full day's acing with the action at Lake Ruataniwha commencing at 8.00am.